It’s been a common debate on whether buying tracks for your equipment is worth the investment. Do you know all the facts to help you make the right decision? Recent research conducted at Elmer’s Manufacturing has shown loads are easier to pull with Tracks than Wheels. For example, a grain cart with 70,000lbs load on tilled ground is 50% easier to pull than a cart with wheels in the same conditions. As you can see above, the bottom of the tire has a much smaller area for weight distribution causing the tire to sink and develop a rut. Once this rut is created, the equipment is continually pulling the tire against the dirt as the tire tries to climb out and falls in again. In the end, you’re left with a rut that’s more compacted, soil more disturbed and your tractor using more fuel to pull the equipment. So what are the real savings? With Tracks on loaded equipment, you can save an average of 11-15% fuel compared to tires. For example, if you’re seeding your 600 acre field with a John Deere 9560r and a Bourgault 7950 Air Cart at 70′ wide and 4MPH. 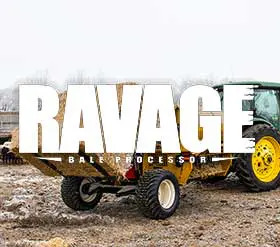 You could save up to $550 on fuel as using tracks will lower your horsepower requirement by 47HP. 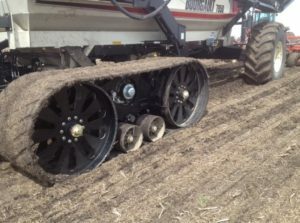 Further, a plot trial has been done by track maker Camso (whom Elmer’s partners with to supply the rubber track) to recognize the benefits of tracks regarding the soil and overall yield. When comparing similar equipment on the same corn field the tracks showed a: 53% improvement in soil compaction, improved seed placement, 2.5x better water infiltration and a larger root ball. After Harvest both plots, the plots where tracks were used had an overall 5% increase in yield. 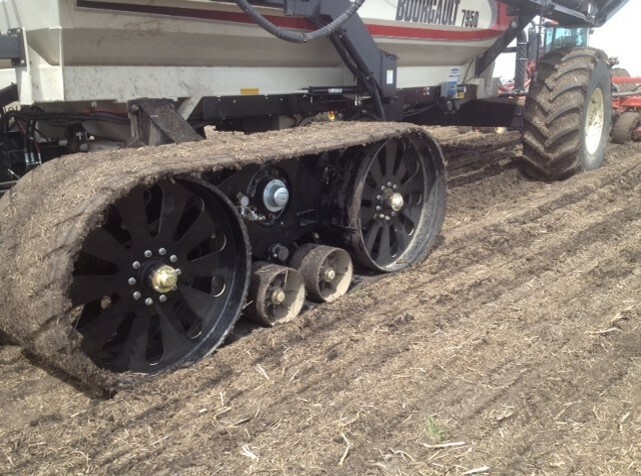 Elmer’s TransferTracks fits most air seeders, caddys and grain carts. 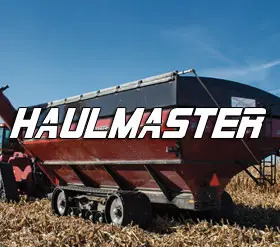 One major advantage of the TransferTracks is that in spring you can use it on your air seeder while in fall you can use it on your grain cart which provides a tremendous amount of value compared to being stuck with it on piece of equipment. Example of how much of a larger rut tire will create compared to Tracks. Below is the same breakdown using a Tri-Axle for comparison. It shows how even a tri-axle will have less ground contact area compared to just our TransferTracks, let alone our large tracks which have even more surface area.